FILE - A screenshot of a web browser displays the WikiLeaks website. Emails among Democratic Party leaders during the early stages of the 2016 presidential candidate selection process appear to show that party insiders mocked and criticized Senator Bernie Sanders, even while they were publicly claiming neutrality in the contest between him and Hillary Clinton, according to information made public by WikiLeaks. Nearly 20,000 emails, all apparently copied from email accounts of seven members of the Democratic National Committee, cover a period from January 2015 through May of this year — before Clinton's victory over Sanders was confirmed. WikiLeaks, a group that publishes original documents from anonymous sources and leakers, released the data without indicating its source, but the 17-month period ended just before a hacking incident in June at the DNC. Democratic officials said at the time that hackers based in Russia were responsible for the intrusion. The party organization has not commented on the emails released by WikiLeaks, but neither has it disputed their authenticity. 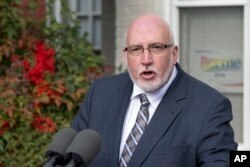 FILE - Jeff Weaver, Sen. Bernie Sanders' campaign manager, says during a news conference at the Bernie 2016 campaign office in Washington that the Democratic National Committee is "actively attempting to undermine" Sanders' White House bid, Dec. 18, 2015. The manager of Sanders' political campaign, Jeff Weaver, said the emails confirmed "what many of us have known for some time": that DNC members were "actively helping the Clinton effort and trying to hurt Bernie Sanders' campaign.'' Weaver told a reporter the disclosures could potentially affect party unity during the Democrats' national convention, which opens Monday in Philadelphia. 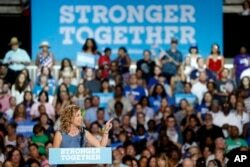 Several of the leaked emails indicated the DNC chairwoman, U.S. Representative Debbie Wasserman Schultz of Florida, and her colleagues favored Clinton over Sanders in the party's primaries and caucuses — a claim the senator and his staff made repeatedly as Clinton's campaign gathered momentum and eventually forced him to end his candidacy. U.S. Rep. Debbie Wasserman Schultz, chairwoman of the Democratic National Committee, speaks during a campaign event for presidential candidate Hillary Clinton at the Florida State Fairgrounds Entertainment Hall in Tampa, July 22, 2016. In one email exchange, Wasserman Schultz was asked by a DNC subordinate whether the party organization should complain to the CNN television network after it aired a comment by Sanders that he would fire the chairwoman if he was elected. She dismissed the idea, telling her staffer, "This is a silly story. He isn't going to be president." Sanders, who campaigned against the financial clout of Wall Street chieftains and growing income inequality in the U.S., won 22 of the 50 state party primaries and caucuses against Clinton, but she effectively claimed the nomination with a string of victories over him in the country's most populous states, which have large numbers of delegates to the national nominating convention. The Sanders campaign had repeatedly accused Democratic Party organizers of treating him unfairly and arranging the candidate selection process in ways that favored Clinton, such as by scheduling debates between the top two candidates on days and times when audiences were likely to be smaller. Many American political experts rated Sanders as a better debater than Clinton, so the scheduling details could be seen as diffusing his appeal to voters. The cache of more than 19,000 emails posted by WikiLeaks covered a variety of subjects, not just the DNC's handling of issues involving Clinton and Sanders. Some disclosed internal conversations about how to respond to pointed questions from news reporters; others showed extensive contacts between DNC members and White House officials about who should be invited to public events — and, in some cases, who should not be invited because of questionable activities in their past.